Do you like vampire-related books and movies? You are likely to be interested in Count Spectacular slot, an epic slot online game developed by Realtime Gaming. As a 2010 release, this 5-reeler has 25 paylines and is not so horror-laden. Although there are several new online games, Count Spectacular slot still appeals to many casino players across the globe. It features gothic cute graphics that don’t impart any horrible yearning for blood. Therefore, there is nothing to discourage you from test driving the reels. The Count Spectacular slot machine features expanding wilds (akin to stacked wilds), 2 randomly activated progressive jackpots you can hit any time, scatters, and an interesting free spins bonus round with a twist. Somewhere in the midst of the vampire’s lair that is decorated with spider webs and ornate columns, you will locate Count Spectacular in his entire glory. Several symbols complement the game’s theme including the Wolf, the Blonde, the Secret Potion, the Garlic, the Stage Coach, the Bat, the Casket, the Goblin, the Lantern, and the Mirror. Interestingly, Count Spectacular is BlackBerry-friendly and also compatible with various other mobile devices. The Count represents the wild, and to complete the winning combinations, it can substitute for all other symbols including the scattered Castles symbols. It is interesting that the Count expands when it pops up to cover the entire reel it lands on, and this translates to large payouts. If you line up 5 wilds on a wagered line, you will earn a top reward valued at 10,000 coins. On the other hand, the castle pays out 2x to 200x your bet stake but it does not activate bonus rounds. Count Spectacular slot online also features RTG’s standard progressive jackpot and a second minor progressive jackpot. You can randomly activate both jackpots at the end of any spin. Sadly, since the two jackpots are randomly activated, you will not be able to utilize any of your desired online slot machine schemes to boost your chances of winning any of these jackpots. To trigger the Free Spins feature, you must have expanding wilds on both reel 1 and reel 5 simultaneously. What sets the Count Spectacular slot aside from most slot machines is the Free Spins feature that offers players two options of bonus rounds. Therefore, you can choose either 12 free spins with tripled wins or 4 re-spins with reels 1 and 5 having locked wilds. Count Spectacular slot game betting limits begin from 0.01 per line up to 25 line, which makes the least spin on all paylines to be 0.25 credits. The maximum bet per line is 5.00, hence all the 25 paylines will cost you 125.00. 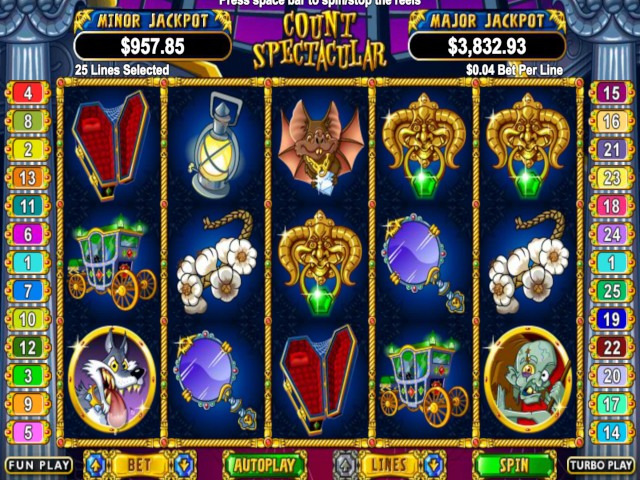 Even if you are new to slot games, there is nothing complicated about Count Spectacular. Truthfully, it is an online slot game worth giving a try.